Mont Fleur is a charming Bed and Breakfast offering excellent value in Wilderness along the Garden Route and is set against the Wilderness mountainside with breathtaking lagoon and sea views. All bedrooms have TV and tea tray, some with king-size beds. 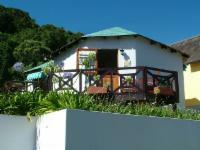 The Honeymoon Cottage has a private deck and barbeque overlooking the garden and sparkling pool. Fabulous birdlife and close to trails. An easy walk to the village and sweeping golden beach. Dinner on request. Internet. Laundry service. "We had an overnight stop here and were warmly welcomed by Lou and Denise. The accomodation was comfortable with lovely sea views. We opted to have our evening meal at Montfleur which was delicious. Breakfast was good too. Thank you to Lou and Denise." "Mont Fleur offered everything we were looking for in terms of appearance, comfort, privacy and friendly hospitality. Besides the stunning view from the main house, the B&B is in easy walking distance to Wilderness Village Centre, the beach, and many lovely walks in the area. Breakfasts were good, with a healthy selection of food available, plus daily home-baked breads and muiffins from the kitchen!. We spent our days exploring the area, or just relaxing on the private deck outside our room, then enjoyed evening meals and live music at local restaurants. We went to Mont Fleur for a relaxing long weekend, and it exceeded our expectations. We would highly recommend it as an ideal breakaway choice." "We have made a trip of one week on the coast and we thanks you for your PORTFOLIO COLLECTION...It was very interesting to book our B and B. We have good souvenirs about them , especially for one in Wilderness, MONTFLEUR, nice home and room and we have had a very warmly welcome and a very good relation ship !" 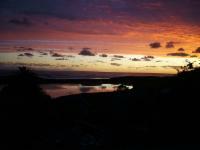 "My husband and I stayed in Mont Fleur 21 -25 November 2009. We were extremely pleased with our stay, that pleased that we returned for two days before leaving SA. Denise, our hostess was always there to assist us in planning our programme: which restaurant to visit and where to find the local bridge club etc. We were most comfortable in our room and enjoyed the delicious breakfast served by Denise.The extra bonus were the discussions we had with her and her husband Luis. We can highly recommend Mont Fleur." "Just a message to thank Portfolio and all the establishments we stayed in during our 5 week holiday to South Africa. The quality of accomodation and friendliness of the people we met was definitely in line with your claims in the various books we received from you. " Turn right at Waterside Road towards the lagoon. About 200 metres down this road turn left into Limberlost Lane and follow road around. S33° 59' 30.77" E22° 34' 57.56"